Fitch Ratings Inc says it has given Resorts World Las Vegas LLC a long-term issuer default rating and senior unsecured rating of ‘A-’, with a stable outlook. On Thursday, Fitch issued a notice saying it had given an ‘A-(EXP)’ expected rating to the proposed senior secured revolver and term-loan facilities for the entity – the promoter of the project – and the proposed senior unsecured notes to be issued by it and its wholly-owned subsidiary, RWLV Capital Inc.
Fitch described Resorts World Las Vegas LLC as a wholly-owned indirect subsidiary of Genting Bhd of Malaysia, and as the developer on the Las Vegas Strip of what has been described as a US$4-billion casino resort (pictured in an artist’s rendering). The Fitch credit rating for the Genting Bhd parent is also A-, with a stable outlook. The Genting group operates casinos in Malaysia, Singapore, the United Kingdom, Egypt, the United States and the Bahamas. The group also has some interests in palm oil plantations, fossil fuels, power and property. 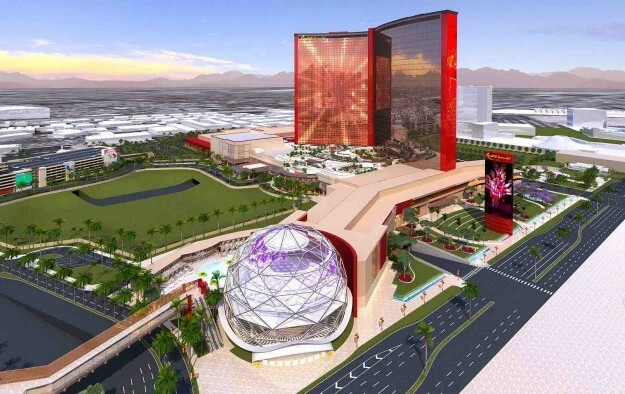 Fitch says Resorts World Las Vegas LLC plans to pay for part of the cost of construction and operation of the Las Vegas casino resort project – referred to as Resorts World Las Vegas – using the proceeds from the proposed secured revolver and term-loan facilities and unsecured notes. The Fitch note stated: “We have equalised RWLV’s [LLC's] ratings with those of Genting [Bhd], based on strong operational and strategic ties between the entities. “We assess RWLV’s standalone credit profile to be in the ‘B’ category, based on geographic concentration, limited market share and brand recognition in the first few years after start-up, ramp-up risk from competitive pressure in a mature market like Las Vegas and weak financial ratios in the initial years until earnings before interest, tax, depreciation and amortisation stabilises. “Ramp-up risk is linked to the resort being a green-field project and the difficulty in ascertaining stabilised EBITDA beyond the construction period,” Fitch said, referring to the resort’s eventual earnings before interest, taxation, depreciation and amortisation. On March 19 the Las Vegas Review-Journal newspaper reported that firefighters had rescued an injured construction worker from the Resorts World Las Vegas project site the day before and taken him to hospital, where staff described his condition as stable. In January, the Genting group and U.S. operator of casinos Wynn Resorts Ltd – parent of Macau casino operator Wynn Macau Ltd – announced that they had settled a dispute about the appearance of the Resorts World Las Vegas casino resort tower, that had threatened to bring work on the project to a halt.